Mary Louise Wills McIntosh Shull, of Bel Aire, Kansas, passed away on April 8, 2019 with her husband of 50 years by her side. The family thanks the Catholic Care Center of Bel Aire for their extraordinary care in her last days. Mary was born to Lawrence and Aurel Lea (Pallister) Wills on February 19, 1946 in Sterling, Kansas. She lived the first three years of her life at the family farm in Rice County, but when she lost both parents by the age of three, she was adopted by her paternal aunt, Bessie Mae (Wills) McIntosh and her husband Daniel Elton McIntosh, Jr. of Clay Center, Kansas. With that, Mary gained an instant sister, Ann, and a few years later they were joined by another sister, Sue. Mary was raised in Clay Center, Kansas, graduated from Clay Center High School in 1964, then earned a degree in Special Education and Speech Therapy from Wichita State University in 1968. During the Spring semester of her sophomore year she studied in Denmark at the University of Copenhagen where she met her husband, Philip Arlan Shull of Dighton, Kansas. They married on July 7, 1968, and started their home in Denver where she taught school for two years. After Phil finished Seminary at Iliff School of Theology in Denver, they were appointed to Chinook, Montana by the United Methodist Church. They lived in Montana for 23 years, where they raised two children, Melinda and Andrew. In those years Mary was a homemaker and taught school, worked as a model for a furrier in Great Falls, was a docent at the C.M. Russell Museum, and enjoyed several years working at Jones & Co., a high-end apparel store in Bozeman. In 1991, Phil and Mary returned to Kansas. Mary taught a year of kindergarten in Ellis, and she and Phil spent the last 15 years in Bel Aire. 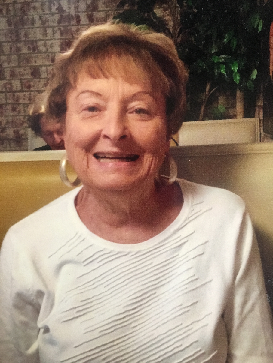 Mary enjoyed reading, golfing, snow and water skiing, traveling and spending time with her family. She was a member of the Alpha Phi sorority, Gamma Xi Chapter, at Wichita State; a member of PEO, Chapter GV; and a member of The Junior League of Wichita and Great Falls, Montana. Mary is survived by: husband Phil; daughter Melinda (Mark) Merrill of Boise, ID; son Andrew (Danielle Unruh) Shull of Canby, Ore.; sister Ann (Thomas) Adrian of Newton, KS; and sister Sue (James) Fawcett of Junction City, KS. She is also survived by ten nieces and nephews and several great nieces and nephews. A memorial service will be held at University United Methodist Church in Wichita on April 22 at 10:30 a.m.; interment will be at Lyons Municipal Cemetery at approximately 2 p.m. In lieu of flowers, please send memorials to University United Methodist Church, 2220 N Yale Ave., Wichita, KS 67220.